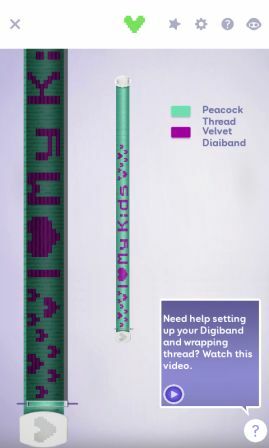 If you think the rubber band looms are cool, then check out this new fun weaving toy from WowWee Company called the Digiloom! 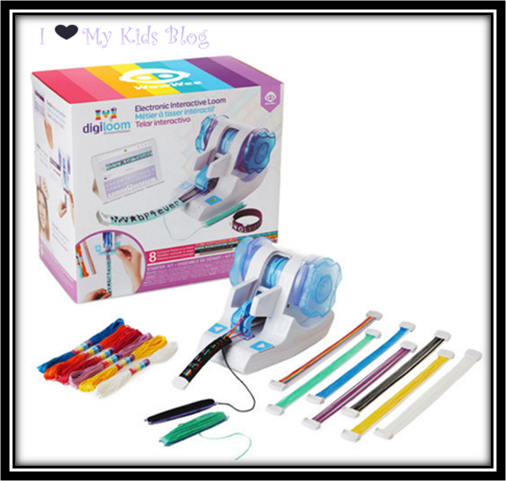 When I was asked to review this electronic interactive loom that allows your child to design, weave, and create their very own bracelets, I knew it was going to be a new favorite toy at my house! With a free, kid friendly app, you can choose from one of the 8 pre-designed bracelets or create your own! There are letters, numbers, symbols and emojis making the possibilities endless! The start kit includes: 1 interactive loom, 8 reusable digibands, 8 thread colors, 2 shuttles, 1 app, instructions and 8 pre-designed patterns. To use this interactive weaving toy, you connect via bluetooth to the free app. The Digiloom app is available on google play and the apple store. It works with Apple and Android devices. There is a full list of compatible devices on the WowWee website. It requires 4 AA batteries that aren’t included. To connect your device to your Digiloom, simply open the app, follow the prompts, and you will be connected! Once in the app you can choose a pre-designed pattern or create one! I chose to create a new pattern. There are tons of fun symbols and emojis to choose from. I opted for a lot of little hearts and the name of our blog, followed by more little hearts. Within the app, there is a helpful video available to watch for each step! The app also shows you which section you are weaving on the bracelet. The Digiloom just hit the shelves on August 4th and is available exclusively at Michaels Stores! The Digiloom sells for $49.99 and themed kits sell for just $7.99. The more you practice the better your digiband bracelets look! As a parent I love that this weaving toy is one that takes time to be played with. I foresee many upcoming winter days when it is too cold to be outside that she will be inside weaving on her app controlled loom! Once she got the hang of the weaving, she really got into making them! It is a really fun toy! 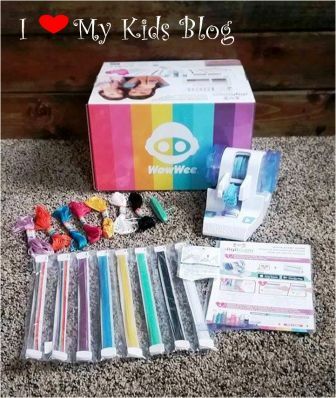 The awesome folks at WowWee have offered to give away 1 Digiloom starter kit to one of our I love my kids blog readers! This giveaway is open to USA & Canada residents. It will end on August 14th at 11:59 pm eastern time. To enter just fill out the form below. Only 1 entry is required to get your name into the drawing, but there are other options that you can complete to earn more entries. Winner will be chosen by random.org and emailed. They have 24 hours to reply or a new winner will be chosen in their place. Good luck! Congrats to our winner Jessica G. from Lousiana! Jessica, you have been emailed and have 24 hours to reply or a new winner will be chosen! LOVE this! My daughter would have so much fun with this!! I would give this to my granddaughter. 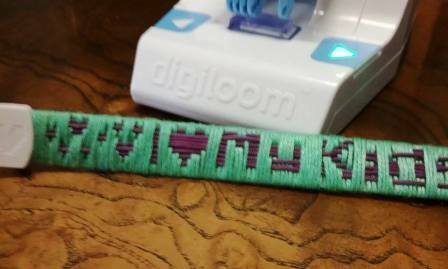 I think she would love to weave colorful bracelets with the Digiloom. I love the digiloom. It would be perfect for my daughters. I would give this to my daughters. They love making gifts for family and I think this would be great for that. You have a blog! You are so amazing! Wish you lived closer! My 11 year old loves the emoji theme kit. Not sure which one I would choose I would let me granddaughter pick. My niece would love this. The Karma Kitty is really cute too. They have a lot of unique items.